You want to quickly know a count of how many fantasy players you have, AND play against in each NFL game for that week. No problem! That’s what Week View is for! Quickly skim through and see which NFL games have the most fantasy action for the week. Our color coding system helps users quickly see the matchups that can help you and hurt you the most. Feel free to click on any matchups in the schedule to display Game View which will show you the lists of players within each game. 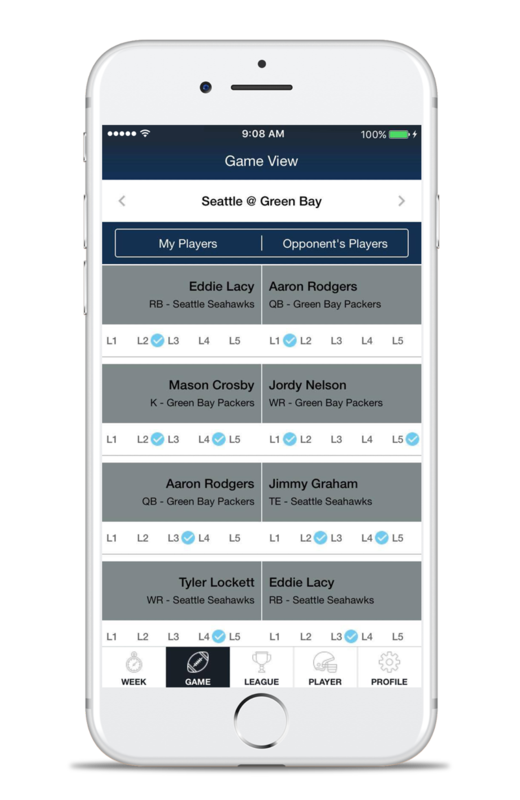 You sit down to watch the Seattle @ Green Bay game and want to quickly know what players you have in all your fantasy leagues for just that one game. No Problem! That’s what Game View is for! 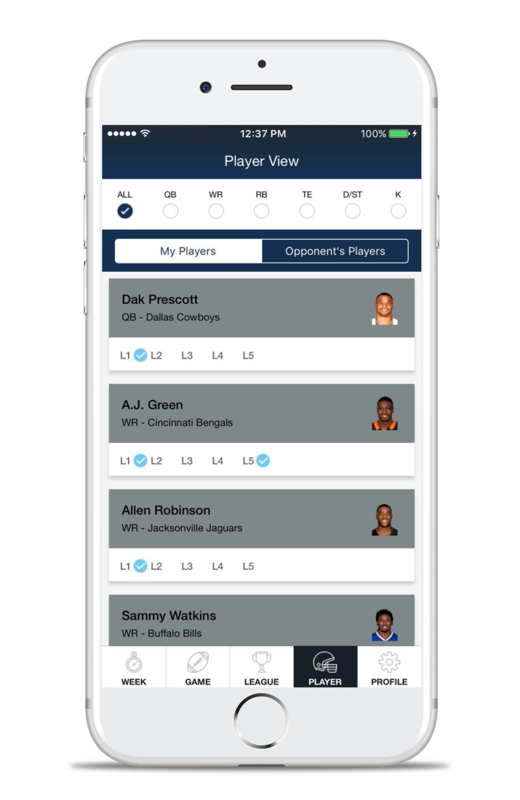 Game View will show you every player you have in fantasy in that game FOR ALL YOUR YAHOO LEAGUES! Not only that, it also shows you who your opponents have in that game! 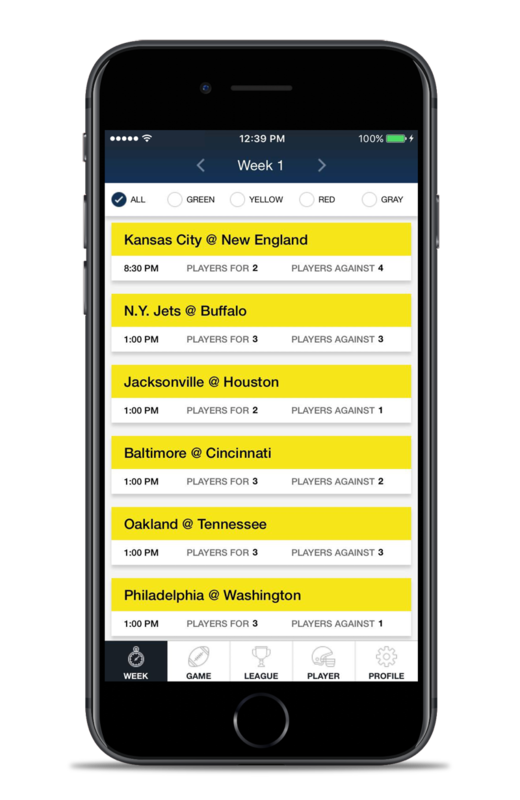 Game View provides users with a complete fantasy snapshot on a game-by-game NFL basis right on one screen – and you can even toggle through the complete NFL schedule via the arrows at the top of the screen. Want to view your standard fantasy matchups, but also be able to toggle between all of them quickly instead of having to drill into and back out of several leagues? No problem! That’s what League View is for! 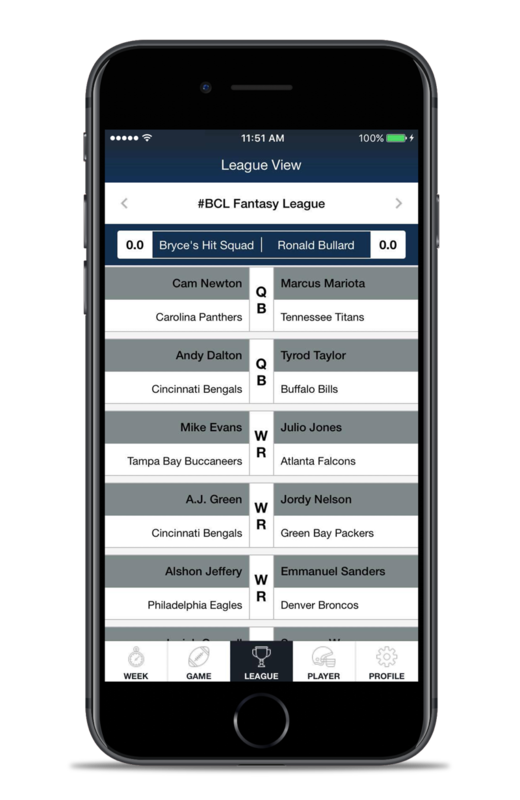 League View will look the most familiar to users, and will show you your one-on-one fantasy matchups. 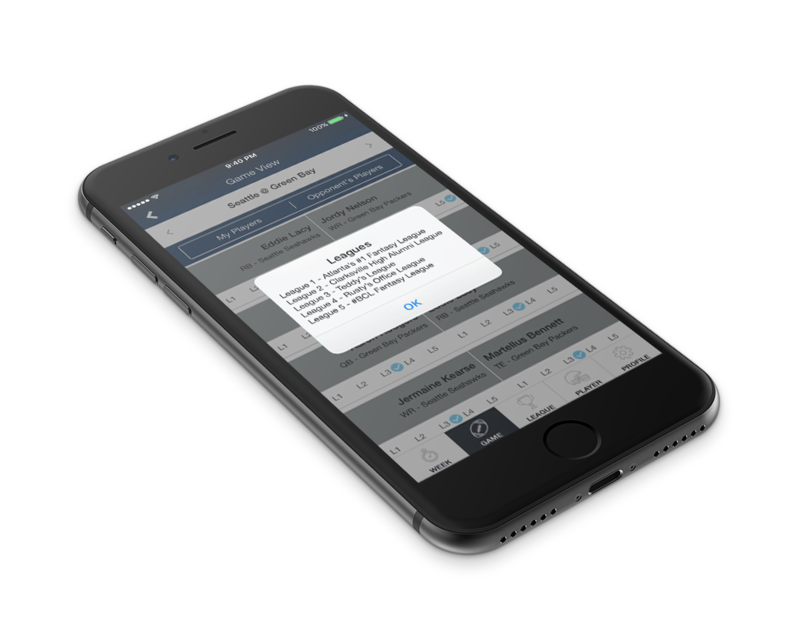 With one push of a button, you can quickly and easily toggle between your matchups in your different leagues instead of having to drill into and back out of different leagues. You are in 5 different fantasy leagues and want to see ALL of your players listed in one place instead of going in and out of 5 different rosters and trying to memorize everyone, while also wanting to see ALL of your opponent’s players, too. No problem! That’s what Player View is for! 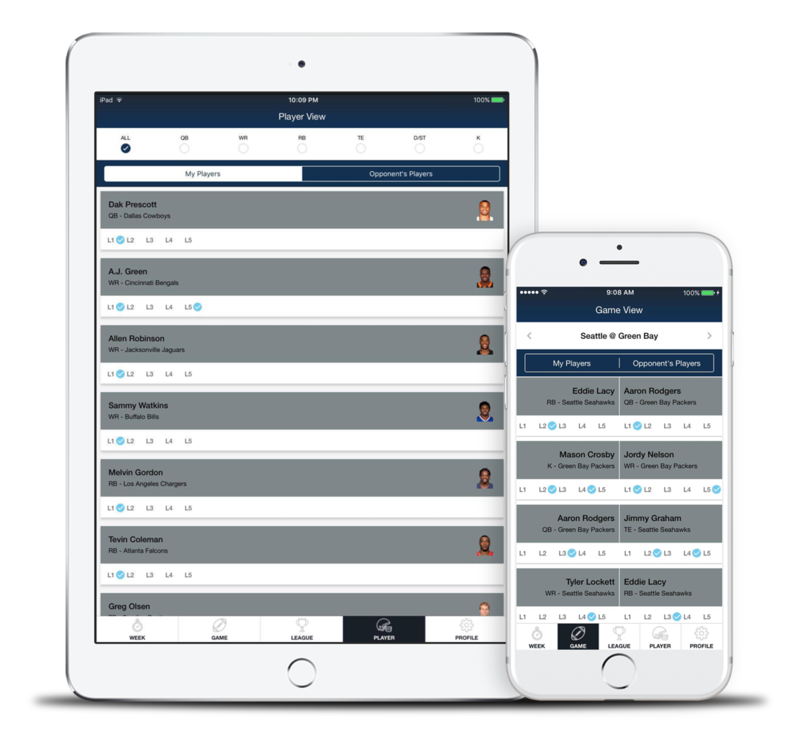 Player View can quickly show you all of your players across all of your leagues…ALL at once! There’s even a button to see all 5 of your opponent’s combined players, too. Player View is also able to be filterable by position(s). Want to see just your opponent’s QB’s in all your leagues? Filter the data down to whatever you need. Player View is very versatile and easy to use. TIP: Click on any of the League Bars beneath a player’s name and a popup notification will appear with your league names. It’s difficult to remember if your office league is League 2 or League 4, so just click on the League Bar at any time for a quick reminder of your official Yahoo league names. 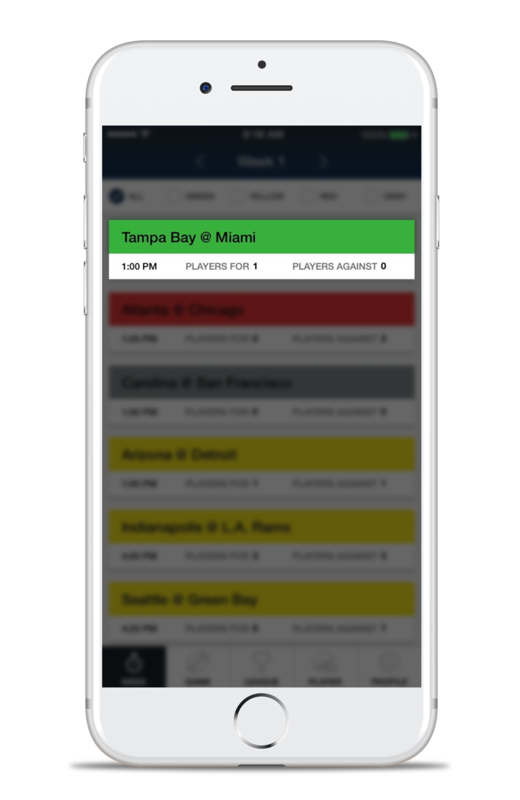 Our simple color coding system below allows users to quickly glance at a game and see which games can help and hurt them the most from a fantasy standpoint. This is a “green light”, if you will, for you to cheer like crazy for your players in these green games without repercussion. No more rooting for someone you know you have, and then realizing later you were also facing him in 2 leagues as well. Relax and know that only good things can happen in matchups that are green. Example: if Tampa Bay @ Miami is GREEN, it means you have players for either Tampa Bay and/or Miami, and you are not facing anyone from those teams throughout all your leagues. The scariest matchups of the week are the Red ones. You are hoping for ugly, rainy 3-0 final slopfests in all of the red games. 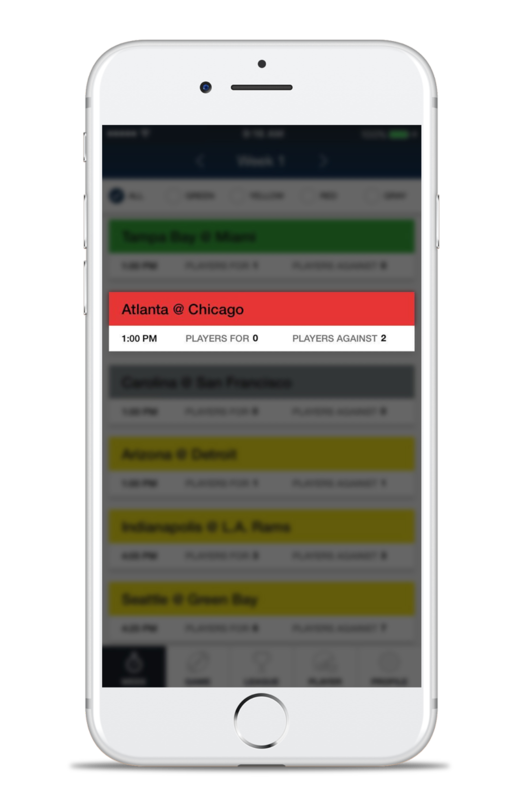 Example: if Atlanta @ Chicago is RED, it means one or more of your opponents have players from either Atlanta and/or Chicago. Games that appear GRAY do not affect you. As far as fantasy football is concerned, you can have complete indifference. “Apathy is the glove into which evil slips its hand” – Bodie Theone. Take a deep breath and know that for the Gray games, you can enjoy them stress-free. Ex: if Carolina @ San Francisco is GRAY, it means neither you nor any opponent have players for either team in that game. Games that appear YELLOW can both help you and hurt you. This means that while watching these games, take a quick look at your Game View to know who you have and who you’re against for this matchup. Example: if Arizona @ Detroit is YELLOW, it means you have players for either Arizona and/or Detroit, and one or more of your opponents has players from either Arizona and/or Detroit.